The current age limit has created a culture of hidden drinking and disrespect for the law. Regardless of whether a person is in the military or simply an adult civilian, he or she ought to be treated as such. If society believes you are responsible enough to go to war, get married, vote, or sign a contract, then you are responsible enough to buy a bottle of beer and toast to living in a country that respects and protects individual rights. It is long past time the law caught up with that reality. Read the whole article at Brookston Beer Bulletin. By now you've heard that Belgian brewing pioneer Pierre Celis left us this weekend at the age of 86. 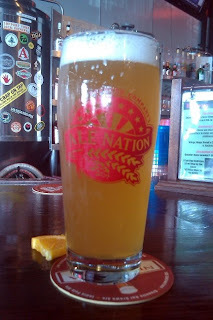 Paris and I went to Nebraska Brewing Company on Sunday to raise a glass of Infinite Wit in Pierre's honor. It's an excellent Witbier: clean, sweet, spicy, and refreshing. Elk Grove What's Wit This Beer? Heavy beer drinkers who have a specific genetic variant in the cluster of three genes that metabolize alcohol are at significantly higher risk of developing non-cardia gastric cancer, according to research presented at the AACR 102nd Annual Meeting 2011. Study results also showed that the same risk is also elevated (but not as significantly) for heavy beer drinkers who do not have the variant, known as rs1230025, and for non-drinkers who have rs1230025 or rs283411. Duell and colleagues conducted a comprehensive analysis of alcohol consumption and gastric cancer risk in the more than 521,000 people aged 35 to 70 years old who participated in the European Prospective Investigation into Cancer and Nutrition (EPIC) study from 1992 through 1998. However, this association was confined to beer. Results showed that drinking 30 grams of pure ethanol/alcohol or more a day from beer was linked to a 75 percent increased risk of developing gastric cancer. Wine and liquor was not associated with gastric cancer risk, Duell said. The exact mechanism for how alcohol may cause gastric cancer is not known. However, Duell said there are compelling hypotheses involving the metabolite of alcohol (acetaldehyde, a toxic and carcinogenic compound), and nitrosamines such as N-nitrosodemethylamine (a known animal carcinogen that has been found in beer). The various lines of evidence indicate that beer may well be as old as cooking itself, which began at least 250,000 years ago. "When people started harnessing fire and cooking, they probably started making beer," Hastorf said. So Neanderthals, and even possibly Homo erectus, may have been the first brewers! Works for me. Read the whole article at Scientific American.